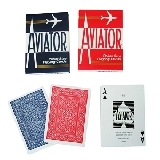 Aviator plastic coated playing cards have enjoyed a long history of quality and value, and they have earned a dedicated following of card enthusiasts. Aviator playing cards comes in poker size, with standard index. Produced by the United States Playing Card Company, the makers of Bicycle & KEM plastic cards. Simply dependable playing cards, with attractive face cards..
Αυτό το προϊόν προστέθηκε στον κατάλογό μας την Thursday 16 April, 2015.